Unless you have been living under a rock, we are sure you have read about the new adventure motorcycle wave that has swept the country. Almost every motorcycle manufacturer has been working on one or at least has been planning on getting one. The latest to enter the scene in India is the Honda Africa Twin. It has generated quite a buzz with its mouth watering price of Rs 12.90 lakh (ex-Delhi). 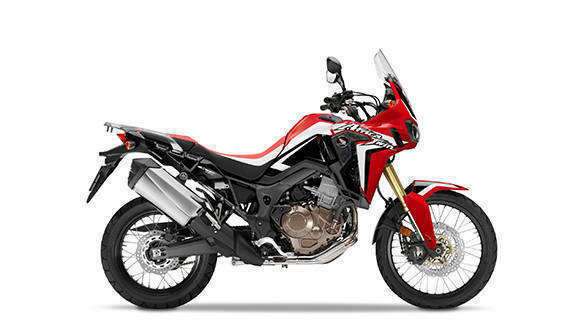 The Honda Africa Twin is being seen as the nemesis to the highly successful Triumph Tiger 800 which has a strong following when it comes to middleweight adventure motorcycles. 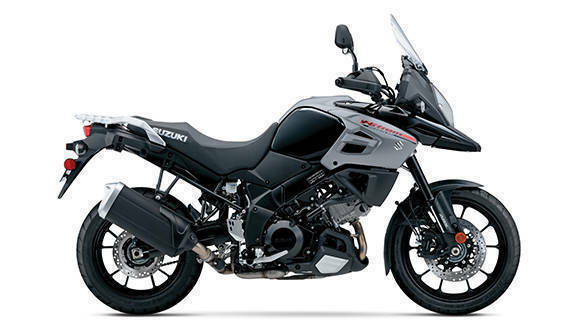 Also landing in this adventure party is the new Ducati Multistrada 950 that builds on the rep set by the larger 1200 S. Now, that there is a battle brewing already, let's get the Japs too in the form of the Kawasaki Versys 1000 and the Suzuki V-Strom 1000. Let's start with the latest entrant, the Honda Africa Twin. It measures 2,334mm in length making it the longest when compared to the Tiger, Multistrada, Versys and the V-Strom. At 932 mm, the Africa Twin is again wider than the others except the Multistrada 950 that measures 995mm. 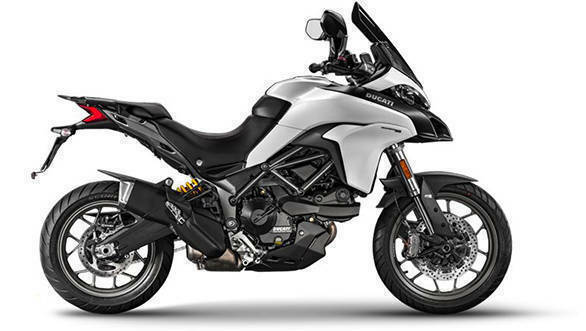 The Multistrada 950 is also taller than the Africa Twin by 47mm, and its wheelbase at 1,594mm is also the longest. That should translate to greater stability at quick highway speeds. 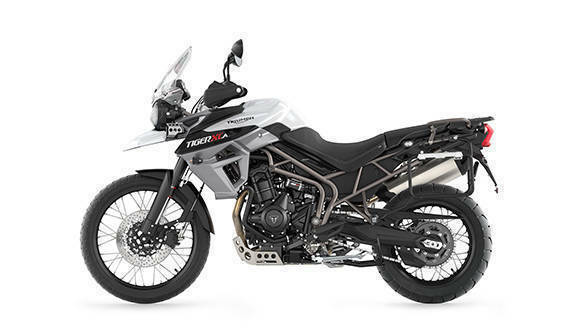 The Africa Twin's wheelbase measures 20mm less than the Multistrada at 1,574mm followed by the V-Strom - 1,555mm, Tiger 800 - 1,545mm and the Versys at 1,520mm. One of the most important aspects of an adventure motorcycle is its seat height especially when you consider the average height of Indians. The Suzuki V-Strom has the tallest seat height at 850mm whereas the rest have a seat height of 840mm. Another figure that's important for an adventure machine is its ground clearance as that determines the off-road capability of the motorcycle. The Multistrada 950 has the second highest ground clearence at 183mm, whereas the of V-Strom's is third at 165mm. The Versys 1000 measures an even lower 150mm, which indicates its sports tourer focus. The Africa Twin, however, has a ground clearance of 250mm which explains the insane locations that it's being ridden on in the promotional videos. 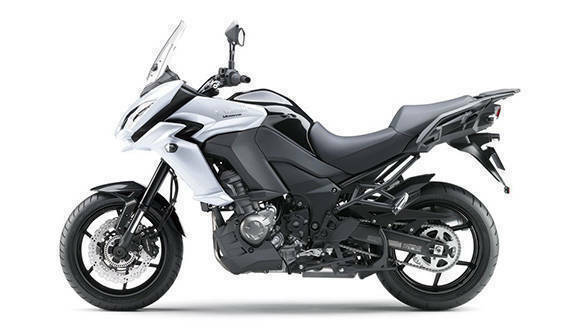 In terms of kerb weight, the the Kawasaki Versys 1000 measures 250kg followed by the Honda Africa Twin at 245kg, the Suzuki V-Strom 1000 at 228kg. The Ducati Multistrada 950 measures a similar 229kg. Triumph does not disclose the kerb weight of its motorcycles and thus the Tiger has a dry weight of 203kg. The Honda Africa Twin is powered by a 999.11cc parallel twin that puts out 88.3PS and 91.9Nm. The most powerful motorcycle of the lot is the Kawasaki Versys 1000 as its 1,043cc produces 120PS and 103Nm. Following the Versys is the Ducati Multistrada 950 at 113PS and 96Nm. The Suzuki V-Strom's 1037cc mill makes 101PS and 103NM. The Triumph Tiger's 800cc motor, has the smallest displacement this group and makes the least power at 95PS and 79Nm. There are basically four riding modes that comes in the Africa Twin. There is the D mode that stretches fuel economy while the three sport modes - S1, S2 and S3 alter the shift points, according to the rider's throttle input as well as holds engine revs for a longer duration. It also comes with a G switch for better traction on challenging terrain, states Honda. In addition to that it gets incline detection, Honda Selectable Torque Control (HSTC) that alters the torque delivery to the rear wheel and ABS. The Multistrada 950 comes with Bosch 9.1MP ABS with three levels of adjustment and Ducati Traction Control (DTC) with eight levels. The Triumph Tiger XCA comes with three riding Modes - road, off-Road, configurable rider that maps the throttle response as well as the ABS. The Suzuki V-Strom 1000 comes with three level traction control adjustments. However, it isin't in the same league as its European rivals. The Kawasaki Versys 1000, on the contrary, comes with two power modes and three levels of traction control. The Honda Africa Twin and the Triumph Tiger 800 are the only two adventure bikes in that range that are more off-road biased. The Africa Twin comes with a Showa 45mm upside down forks in the front while the rear comes with an adjustable mono shock. Both the front and rear suspensions come with preload and rebound dampening adjustment. A suspension travel of 230mm (front) and 220mm (rear) contributes to the bike's off-road capability. The XCA comes with WP 43 mm upside down forks with adjustable rebound and compression damping in the front and WP monoshock with hydraulically adjustable preload and rebound in the rear. This one has a suspension travel of 225mm (front) and 215mm (rear). However, the Triumph Tiger range is divided into road biased XR and off-road biased XC. The Triumph Tiger XR is the range starter and comes with ABS and switchable traction control as standard. The XRX, that is the top-end road biased model comes equipped with three riding modes, cruise control, adjustable front screen and hand guards. Moving on the off-road centric XC range, the XCX comes with engine protection bars, aluminium sump guard, radiator guard and an additional charging socket. The top of the line XCA comes with a more powerful alternator for heated grips and seats. Additionally, it also comes equipped with LED auxiliary fog lights, aluminium radiator guard, GPS mounting kit, third charging socket and off-road footrests. The Ducati Multistrada 950 gets KYB 48 mm fully adjustable USD forks in the front and a fully adjustable Sachs monoshock unit in the rear with spring preload adjustment. If are looking for the most affordable adventure motorcycle amongst these options, it is the Triumph Tiger. The standard XR is priced at Rs 10.60 lakh. Shell out Rs 93,000 more and you can get the Ducati Multistrada 950. Further, the Honda Africa Twin DCT is priced at Rs 12.90 lakh that makes it rival the Triumph Tiger 800 XCX. The only equipment that comes on the Tiger, that the Africa Twin misses on is the engine protection guard. However, the Africa Twin comes with more riding aid electronics such as the traction altering G switch, LED lights, incline detection feature and many more. Additionally, the Africa Twin makes 88PS/91.9Nm that is sufficient for an lightweight off-road machine like this one. The Tiger does make higher power but also at a higher rpm. 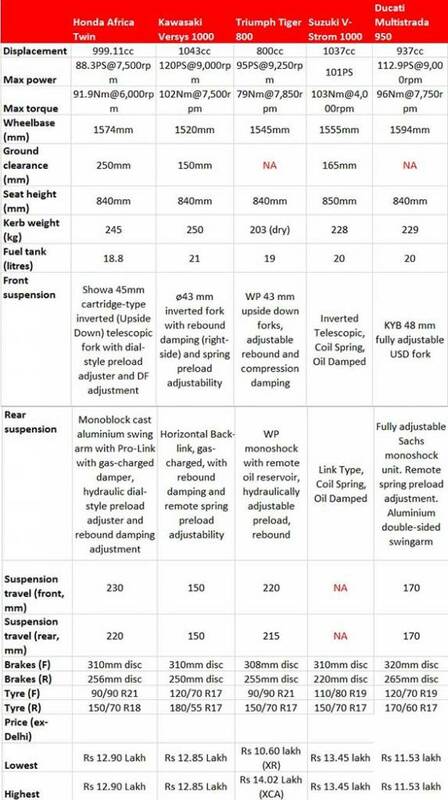 The suspension travel of both these adventure machines is more or less similar. The Kawasaki Versys 1000 is closely priced to the Honda Africa Twin but doesn't have as much appeal, except if you are looking solely for a fast, sports tourer. Similar is the case with the Suzuki V-Strom 1000. While these are just numbers, a real world adventure bike battle will help us pick a clear winner. Let us know your pick in the comments section below.